Do you want to change your WordPress website or blogs homepage? Is your homepage showing the wrong page or post? 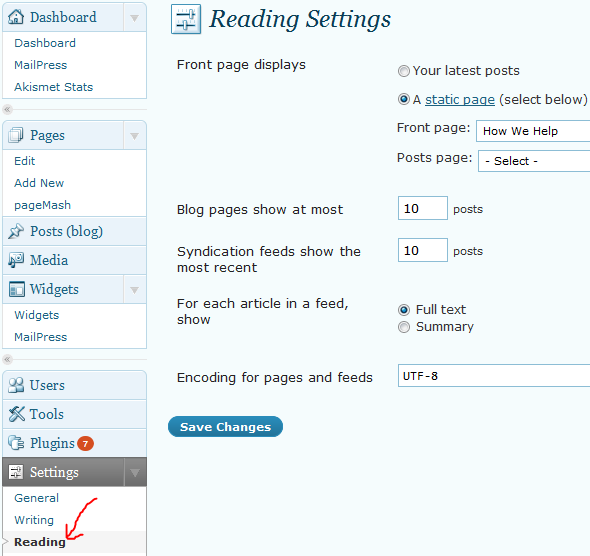 Changing and setting your WordPress website’s homepage can be accomplished by logging in to your website admin area and navigating to the “Reading” option under the “Settings” tab. Next choose the “Front Page Displays” (your homepage) option that you’d like and click the save button and you’re all set! If you haven’t yet created a homepage, add a new page named “Home” and return to the Reading Settings and set your new “Home” page as your Front Page. For ITegrity built websites, if you want to set one of your existing pages to be your homepage and don’t want it to appear in your website’s main navigation, first set the page as your Front Page. Next go to pageMash in you “Pages” tab and hide the page. This will prevent the page from appearing in your website navigation as a normal page, but will appear as your homepage and also when a user clicks on the “Home” link your navigation. This does help. I’ve been trying to edit some content on my home page. It was hard to find. The internal pages are much easier to edit.